This grand Queen Anne home—festooned with towers, dormers, and ornamental details—was built around 1890 as the home of physician W. J. Conan. 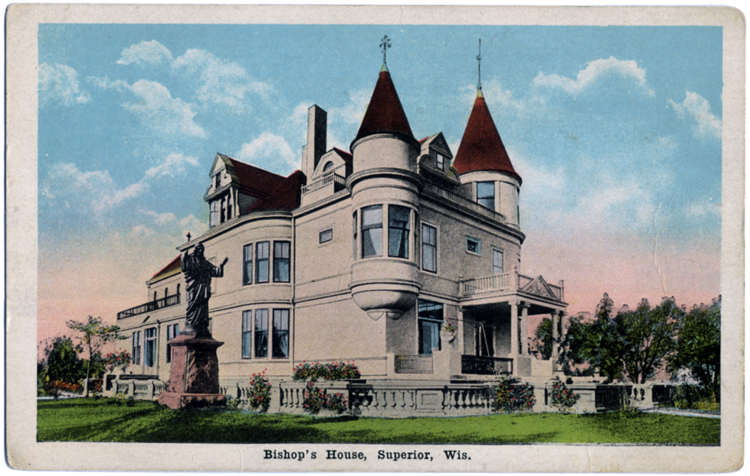 It became the residence of the Right Reverend Augustine Francis Schinner, bishop of the Superior Diocese (composed of northern Wisconsin’s sixteen counties), in 1905 when the diocese first formed. Schinner lived there until 1913, when he resigned; he later took a position as bishop of Spokane, Washington, where he died in 1921. Following Schinner, bishops Joseph Koudelka, Joseph Pinten, Theodore Reverman, William O’Connor, Albert Meyer, Joseph Annebring, and George A. Hammes lived in the house. The building was razed in 1965. The postcard above dates from between 1915 and 1925.